Exploration and fun is around every corner with the Busy Learner’s Activity Cube by VTech. 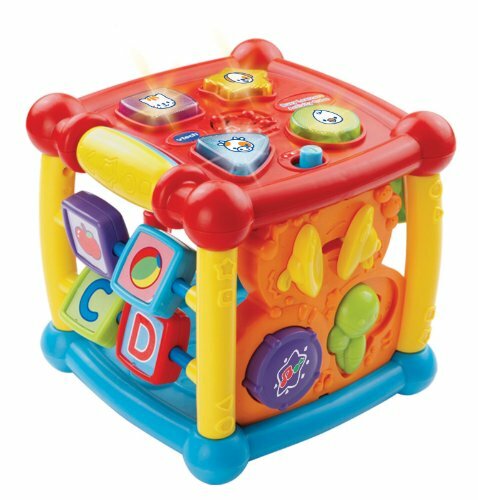 Featuring five sides to explore, this play cube attracts your baby’s attention and encourages imaginative play with music, light-up buttons, colors and more. Shape and animal buttons introduce animal names, animal sounds, and shapes. Press and slide musical instrument buttons introduce instrument names, sounds, and colors. Sliding, spinning blocks promote interaction and fine motor skill development. This interactive cube also plays fun sounds when it's moved. Plays 25 sing-along songs and melodies. VTech, the creator of the Electronic Learning Products (ELP) category, is a world leader in age-appropriate learning toys. Since 1976, VTech has been developing high-quality, innovative educational products for children from birth to tween. VTech toys deliver "smart play" through the combination of entertaining electronic formats and engaging, age-appropriate content that helps children learn while having fun.